The skull of a soldier who participated in the 1361 campaign. The Battle of Visby was fought in 1361 near the town of Visby on the island of Gotland, between the forces of the Danish king and the Gutnish country yeomen. The Danish force was victorious. On 22 July 1361, King Valdemar IV of Denmark (Valdemar Atterdag) sent an army ashore on Gotland's west coast. The Gutes of Gotland paid taxes to the King of Sweden, though the population of Visby was diverse and included people of Ruthenian descent, Danes and Germans. In 1280 the city of Visby had joined the Wendish City-alliance along with Riga, Lübeck, Tallinn and other large population centers from northern Europe, further separating Visby from the Gutnish countryside. 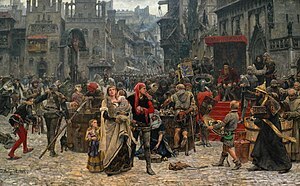 Antagonism between the city dwellers and the Gutnish country yeomen heightened; the latter were defeated in battle in 1288, despite the aid of knights from Estonia. It is unknown who commanded the Gutnish army. However, he was probably a minor noble of some standing, probably with military experience. The Danish army was composed mainly of Danish and German troops, many mercenaries from the Baltic coast of Germany, with recent experience in the various feuds and wars between the German and Scandinavian states. These men would have worn what was known as Transitional armour, with iron or steel plates over vital areas and joints over a full suit of chain mail. They were led by Valdemar IV of Denmark. Against them was an army of Gutes, mainly freemen and minor nobles. The ordinary freemen appear to have worn more limited but still effective protection, with many skeletons that were excavated wearing a chain-mail shirt or a coat of plates to protect the torso. Some warriors may have worn a padded Gambeson or a leather jerkin or coat, though these would not have survived the decomposition in the ground after the battle. Unusually, many appear to have not had protection for their head, with many skulls wearing only a mail coif for protection, though any helmets may have been stripped from the bodies after the battle. Very few weapons have been discovered, but it is likely that both sides used round and heater-type shields, spears, axes, billhooks, pikes and poleaxes. For close combat, both sides would have had swords, light axes, war hammers and maces. Picture of the Visby city wall, near the north gate. The main battle was fought within 300 meters of the city's fortifications. The Danish troops moved towards Visby. The first day of the invasion, two minor skirmishes were fought on marshy ground between yeomen farmers and the army. The next day from 800-1000 farmers were killed after massing for battle at Mästerby near Fjäle mire. On 27 July, a Gutnish yeomen army fought the Danes just outside the city walls and was severely beaten, with an estimated death toll of about 1,800 yeomen and peasants; the Danish casualties remain unknown. Only a couple of items that can be linked with Danish soldiers have been found, including a purse and ornamented armor belonging to a member of the Roorda Family from Friesland. Casualties can be compared with those that the French suffered at the Battle of Poitiers in 1356 and would be considered high by medieval standards. The Visby ransom as Carl Gustaf Hellqvist imagined it. Following the devastating battle, the citizens of Visby decided to surrender to avoid further losses. To save the city from a sacking, the inhabitants paid a large amount of their wealth to King Valdemar. This extortion of contributions became a legendary event, although it cannot be confirmed to have taken place and, if so, the full details are still unclear. Despite the payment, the Danes still plundered several of the town's churches and monasteries. King Valdemar appointed sheriffs to govern Visby and then set sail again. It would take another year before he officially added "King Of Gotland" to his many titles. When Albert, King of Sweden, took the Swedish crown he claimed Gotland as part of his domains and held the island at least until 1369; thus, the Danish presence there couldn't have been strong, as it so rapidly and easily returned to the Swedish crown. The island would be disputed over by the House of Mecklenburg and the Danish crown until 1376, when Queen Margaret (the daughter of the late King Valdemar) officially claimed the island for Denmark. In 1389 King Albert was defeated in a civil war, in which Queen Margaret supported the "rebels", and he was forced to abdicate. However, he was granted Gotland and its "capital" Visby, where he remained with a "pirate" organization called the Victual Brothers. It was not until 1408 that the last remains of the house of Mecklenburg and the above-mentioned pirates were driven out for good. The mass grave at Korsbetningen during the 1905 excavation. The first archeological excavations were done in 1905, led by Oscar Wilhelm Wennersten and master builder Nils Pettersson at the place now known as Korsbetningen in Visby, where the first mass grave from the battle was found. The excavation also revealed the location of the Solberga Abbey. It showed that at least a third of the Gotlandic army consisted of minors and elderly. Many of the dead defenders were, unusually, buried in their armour; according to historian John Keegan "...hot weather and their great number (about 2,000 bodies were disinterred six hundred years later) defeated the efforts of the victors to strip them before decomposition began". The site of the excavation "yielded one of the most fearsome revelations of a medieval battle known to archaeologists". Five mass-graves were located outside the city's walls. Every year, during the Medieval Week on Gotland, a historical reenactment of King Valdemar IV of Denmark's entrance and ransoming of Visby is staged at the historical site. Since 2011, the Battle of Visby itself is reenacted outside the Visby city wall with participants from historical societies from several European countries and the United States. ^ Ohlén, Carl-Eric; Scharp, Dag W.; Rehnberg, Mats, eds. (1973). Från fars och farfars tid [From father's and grandfather's time] (in Swedish) (2nd ed.). Visby: Gotlandskonst AB. p. 402. Retrieved 10 April 2015. ^ Gotland Museum. "Korsbetningen utanför Visby stadsmur" [The Korsbetningen outside Visby] (in Swedish). Sveriges läns- och regionmuseer. Archived from the original on 2010-08-21. Retrieved 2011-05-12. ^ "Medieval week on Gotland". www.medeltidsveckan.se. Medeltidsveckan. Archived from the original on 28 April 2014. Retrieved 4 June 2014. ^ "Battle of Wisby 1361". www.battleofwisby.com. Battle of Wisby 1361. Archived from the original on 6 June 2014. Retrieved 4 June 2014. Thordeman, Bengt (1944). Invasion på Gotland 1361: dikt och verklighet [Invasion of Gotland in 1361: fact and fiction] (in Swedish). Stockholm: Geber. Thordeman, Bengt; Nörlund, Poul; Ingelmark, Bo E. (2001). Armour from the Battle of Wisby, 1361. [Union City, Calif.]: Chivalry Bookshelf. ISBN 1-891448-05-6. Westholm, Gun (2007). Visby 1361: invasionen [Visby 1361: The invasion] (in Swedish). Stockholm: Prisma. ISBN 978-91-518-4568-5. Peter Fairweather page with photos of disinterred corpses.